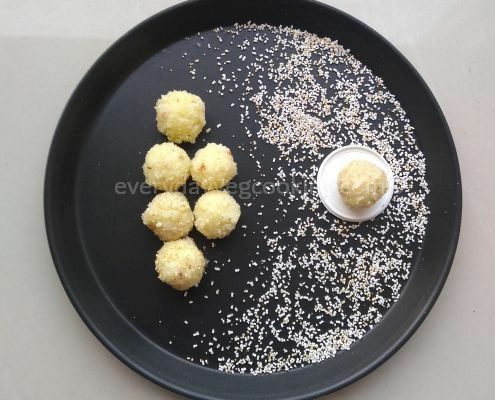 Fresh coconut and rajgira ke laddu are one of the simplest and easiest to make sweets which is perfect for fasting (vrat) and festive occasions. To make laddus from coconut and rajgira, only four basic ingredients are required: freshly grated coconut, rajgira, sugar and milk. To this mixture, add some other special ingredients based on your liking; such as saffron, cardamom powder, almond and cashew nuts. These laddus are very soft and smooth in texture and they tend to melt in the mouth. Soak saffron in 1 tsp milk and crush it. Chop almond and cashew nuts into tiny pieces. Using a vegetable peeler, peel the thin, brown skin from the coconut. Grate coconut or cut into thin ribbons and grind it in a mixie. 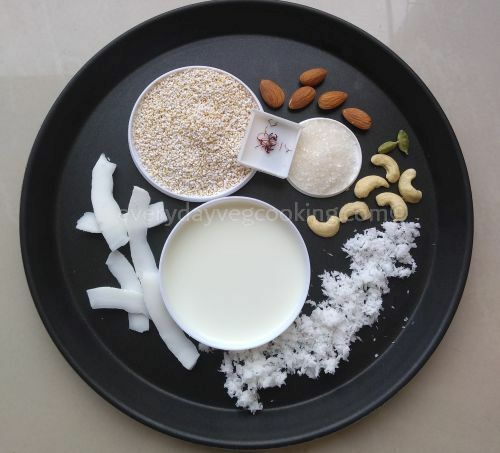 In a heavy bottom kadhai (wok) combine milk and grated coconut and cook on medium flame, keep stirring occasionally. As the mixture begins to thicken, you can see lots of bubbles rising up. Reduce the flame and start stirring the mixture continuously. Bubbles will disappear and the mixture will combine together. Now add sugar, keep stirring till the sugar melts. Now add rajgira, cardamom powder, saffron, almonds, and cashew nuts. Mix properly and switch off the flame. Transfer mixture onto a plate and let it cool. When the mixture is slightly warm, take sufficient portion and shape it into small lemon sized balls. Soft and smooth laddus are ready to melt in the mouth. 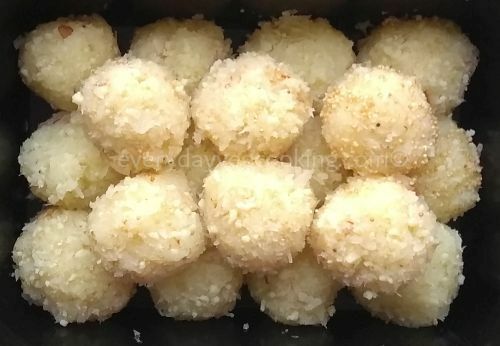 Fresh coconut laddus do not have a long shelf life so keep in the refrigerator and enjoy for one week. Hi Suman, Thanks for sharing this recipe.. I will try this recipe. Hello Varsha, glad to know that you liked this recipe. Looks so yummy! Must try.